Bedlam is right: listening to this year 2008 album from THE MARS VOLTA is like being locked in a small room with a rabid pit bull. After their previous (and excellent) "Amputechture" in 2006, I began to wonder if the band was nearing an aesthetic rut, and if they could sustain the same high level of dizzy creativity for much longer. Here's the answer: apparently not. But after diving so aggressively into the same stylistic well for so long it's hardly surprising they came up dry for once. The album certainly opens strong. 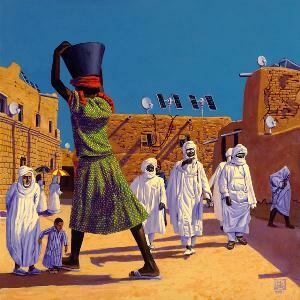 The song "Aberinkula" is a certified Mars Volta classic, highlighting all the strongest assets of this unique band: in-your-face pyrotechnic displays of virtuosity, hypertense manic vocals, and at least one frantic instrumental break almost guaranteed to damage your brain cells. But after that it's like a needle stuck in the same acid-filled groove, with little relief from the chaos of sound or the torrent of arcane lyrical imagery (there's too much emphasis here on the words, at the expense of the otherwise jaw-dropping level of musicianship). As expected there's no shortage of energy. But for the first time on a Mars Volta studio album the writing seems unaccountably forced, with a conspicuous absence of memorable hooks. The trademark psychedelic intensity of the band's earlier albums is shoved so hard into one ear that it pops too quickly out the other, without leaving anything like a lasting impression. On a more personal level, I should note I waited over a year, and through multiple listenings, before deciding to settle on an opinion of the album, in the hope that it would somehow ripen with age. Sadly it hasn't yet, but difficult music sometimes has a habit of sneaking up behind you, and with luck it may still happen.